One of the criticisms of more than one reviewer and beta player is that the post-battle unlock choices were not clear, because all you got to base your decision on was an icon and a name. There should be a patch today or tomorrow with that (and may many other changes) in. So, Cliff asked me to blog my thoughts on developing Redshirt so far. My response as I sat down to try write this was “Gosh, where do I start in talking about this massive project that has been my life since last summer? After all, I’d been a videogames PhD researcher, and I’d worked on smaller things before (as well as bigger, non-gamesy things), but Redshirt is my first proper commercial game project. Its origin lies in an idea I’d had – social networks govern the daily lives of so many of us now, and give rise to their own set of micropolitics and behavioural quirks, so why not make a simulation game about that? I briefly talked about the story of pitching the game to Positech in my first dev video, and how it evolved into Redshirt, so I won’t go into that here, but, as of 15th June 2011, I put cursor to code. I’d opted for Unity as my development tool of choice, because I’d used it comfortably for smaller, throwaway personal projects and was definitely enamored with how it expedites things. As someone who insisted on Notepad for years when I was doing web programming, I certainly understand the impulse to shrug off fancy IDEs and editors and such, but I knew with this project, I’d have my hands full with PLENTY of challenges anyway, so, I wanted to make life easier for myself by using Unity. Or so I thought, anyway. The thing is, Redshirt relies heavily upon its user interface; it is, by nature, a very UI-centric game – which meant that Unity’s notoriously lacking built-in GUI system wouldn’t cut it. Unfortunately, the available third-party solutions also didn’t do exactly what I needed them to do, or were otherwise incomplete in many ways. I ended up writing so much custom functionality anyway, and doing more work on fixing the UI than I’d anticipated; there was that time, for example, when I spent a whole long weekend fixing scrollbars. Scrollbars, of all things. Of course, once they were done, I felt a massive sense of achievement – and, that’s something else this project has taught me. The motivational peaks and troughs that come with getting things working which no other sane person will even think about twice. While I expected plenty of challenges (and wow, did I get them! ), I did not prepare for stretches of time where progress just felt so slow. This happened around months 3-6, and things felt largely like trying to run through a pool of really thick, viscous liquid. Around this time, I’d been busy working on implementing the Spacebook (more work than I’d thought it’d be, naturally! ), but a lot of the other functionality remained unfinished, and things were taking massively longer than I’d projected. Often, things still feel fairly painfully slow to progress, but either I’m used to the feeling it now, or I’m slowly coming out the other side, and seeing things come together. Either way, the thing that gets you through those periods is really loving the concept of the game, and what it’s trying to achieve, and knowing it just needs to get made. Of course, the perversely funny thing is that all the focus I’d been putting on worrying about systems, and how they would interact, sort of came second to the feeling of the game ‘evolving’ when things happened which I thought should be inconsequential, or secondary. Like adding sound, or avatar animations, or seeing the UI mockups from our wonderful artists. It was an odd sort of experience, which made me refocus on the fact that games are these magical things that somehow feel like more than the sum of their parts. And, oddly, no matter how much work you put into your own project, when someone else does a good job on part of it – like with the game’s logo art, for instance – it somehow makes it feel more real! All of this means, though, that I’m getting to a stage where I’m beginning to feel that there is an actual game amongst all the mess I’ve been staring at for months. That is a good feeling! Right now, as I write, the majority of the core functionality exists for the game already; I’m working on character creation, and adding a few things to the Spacebook feature. Next, it’ll be a matter of adding a load of content – and, at the same time, beginning to incorporate the flashy new UI designs. Then, it’ll be more art, and a whole lot of testing, no doubt. On the whole, I’m happy with how Redshirt is shaping up, and I look forward to sharing more about the game soon! “GTB’s eight episode campaign might be playable from two perspectives, incredibly challenging at the highest difficult level, and supplemented by an arsenal of user-made maps and challenges that grows by the hour, but you may still find yourself feeling short-changed. Though community-crafted levels are always a convenient click away (assuming you’re online) and are rated and commented upon by downloaders, sorting wheat from chaff can still be hit-and-miss. Because I’m not someone that ever pays attention to numbers or stats regarding game content (36 hours gameplay? for who? at what difficulty? at what speed? ), I tend to have a bit of a blind spot to that topic in my own. To my mind, the campaign is just a teaser saying ‘here are some of the things you can do with maps’, assuming that even if 1% of the buyers ever made a map worth sharing, the number of maps would be huge. However, it is fair to say that people don’t necessarily want to play user-made maps, and that obviously the person most fluent with the editor is me, so it makes sense to provide enough maps for people that user-made ones are entirely optional. To that end, I’m happily chiseling away at the coalface making more maps. I’m 90% done on two new ones, a daytime snow map, And a nice evening desert battle. I’m trying to be as inventive as possible. The snow map, for example has two main routes. 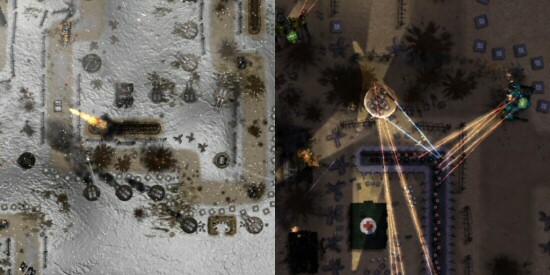 One is short, but surrounded by concentrated enemies, the other is torourously long but the enemy locations are more scattered. So far, after many test battles, I can’t say that either route is an obvious choice, it all depends on your play style and unit choice. I’ll almost certainly add more maps before release, especially once I get into the swing of creating them. The shadowmaps and the balancing take most of the time. So if you already bought the game, you have 8 campaign maps, and 2 more will appear in patch 1.04, hopefully this coming weekend. I’m hoping to add some more after that too, but I always try to be very conservative when it comes to promising stuff until it’s actually done. If you bought / are considering GTB, how important is the number of singleplayer campaign maps to you? 1) Fixed bug where sometimes shadowmaps were not being generated at all for custom maps and downloaded maps. 2) Fixed bug where challenges on unedited maps failed to cunningly re-use existing shadowmaps. 3) Changed costs of augmentations to be either 5 or 15 for type II improved ones, infantry now only pay 1/5th of these costs. 4) Fixed bug where editing the appearance of an existing unit and saving it was not reflected correctly in the unit picker. 6) Fixed size issue for the unlock window under certain circumstances. 7) Fixed bug where music did not resume on alt+tab during a battles post mortem. 8) You can now no longer accidentally scroll the map with WSAD or pick any new units once a battle has ended. 9) Nightvision and route-display buttons now correctly toggle if you use hotkeys for those features. 10) Text boxes now correctly supports ,+£$%^=. 11) Fixed some bugs relating to unit designs saving and also loading in of unit text descriptions. 12) Exiting the map editor now takes you to the battle browser screen, not the main menu. 13) Fixed typo on defend button tooltip. 14) Fixed bug where support units could still give bonuses after deconstruction. 15) Fixed some typos in the manual and tutorial and elsewhere. 16) Fixed bug where overwriting an existing design left a temporary copy of the old one usable until the app quits. 17) Removed empty tooltips on badge editor. 18) Blueprints icons for support modules now show the greyed-out icon as a hint. 19) You now can no longer use duplciate augmentations, or two of the same type on a single unit. 20) Renamed the user profile button to profile/online so it's clearer where social stuff is. 21) Module comparison window now greys out and shows locked icons for modules you are yet to unlock. 22) Minimap and buttons no longer work, or buttons change mouse if the minimap is hidden by the player. 23) Fixed bug with mismatched icons & tooltips after deleting current unit design then changing hull. 24) Added new 'division manager' feature to control what units show up in the deployment bar during a battle. 25) deployment bar now consistently sorts designs by their type. A picture speaks a thousand words, and a video draws a thousand pictures?, or whatever… But here is a video of me explaining and showing how the new ‘divisions’ feature for Gratuitous Tank Battles works, and how to use it. I’m quite pleased with it. It will be in patch 1.003, which after a little bit of final testing will be release tommorow. Like A dork I broke my wireless router today trying to install a new aerial booster. BAH. Tomorrow an urgently ordered new one shows up. There goes a days sales :( Plus hopefully my much wanted new desk, which is very English and wooden and cheesy and old fashioned, but it will suit my house, which a modern shiny thing would just look odd in. Anyway. Enjoy the video, critiques and comments most welcome.